Have fun with your client in turning their bathroom dream into reality, and do it with a huge selection of bathroom products at our amazing wholesale prices you can’t find anywhere else in the industry. Our ProSource® showroom in Port Richey is your place for bathroom remodel products! 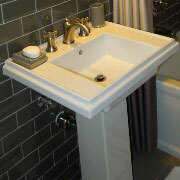 Don’t wash design down the drain by not refreshing your bathroom sink! Add your client’s design style and choose from chic and modern sinks to classic and charming — our Port Richey showroom has all of your bathroom sink needs! 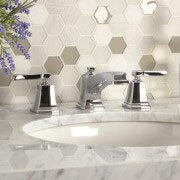 Do you have a client who loves oval sink faucet handles, or another who’d rather customize? At ProSource of Port Richey, we can do both. You’ll be blown away with our selection of faucet colors, types, and brands we have in our collection. Showers are a place where people can relax and wash away the stress of the day. Help your client actualize the shower scape of their dreams. Whether they’re looking for a steam shower or a shower with multiple shower heads, ProSource of Port Richey is your home for high quality showers and shower parts. 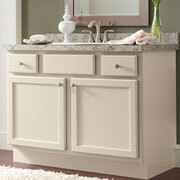 Perhaps the goal in your client's bathroom remodel is to turn a small space into one that appears bigger! Removing hodgepodge items and storing them in a vanity instantly cleans up the space and provides much needed storage solutions. 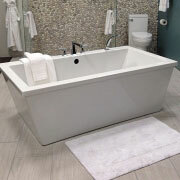 Soaking in the tub can help relieve muscle tension or simply be someone’s preferred method of bathing, so choosing a tub that fits in with your client’s lifestyle will make the remodel all the more of a success. What makes them the most happy? A clawfoot tub or a jacuzzi tub fixed with jets? Shop our tub collection! 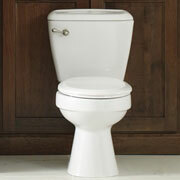 In a bathroom remodel, most clients don’t know that there is a whole market dedicated to just toilets. Guide your client to the best throne — whether it be a one- or two-piece toilet or a smart toilet that automatically flushes. Our showroom serves all of the neighboring cities including Port Richey, New Port Richey, and 30 other area cities. The ProSource of Port Richey showroom is conveniently located in Hudson, Florida and serves all of the neighboring cities including Aripeka, Bayonet Point, Beverly Hills, Brooksville, Bushnell, Crystal River, Crystal Springs, Dade City, Dunnellon, Elfers, Floral City, Hernando, Hernando Beach, Holder, Holiday, Homosassa, Homosassa Springs, Hudson, Inverness, Istachatta, Lacoochee, Lake Panasoffkee, Land O Lakes, Lecanto, New Port Richey, Nobleton, Port Richey, Saint Leo, San Antonio, Spring Hill, Trilby, Trinity, Webster, Weeki Wachee, Wesley Chapel and Zephyrhills.